From the Anarchy Archives, with a large number of corrections by libcom.org. Unfortunately chapters 11 and 12 have the text garbled and so are omitted here in text format, as the appendices. Everything, however is in the PDF document below. looks like it has the missing bits, although the chapters are labelled differently. Despite the fact that this is over-focussed on anarchism in Cuba, to the detriment of much of the wider class aspects (this is as far as I remember, since i haven't read it for a very long time), it's good to see this put out in the library. Today in describing Cuba old familiar ideologies have been given a renewed airing though not really daring to speak their names. Things like: the great socialist Cuban republic, the workers' state; the beginning of communist society etc are spoken of in hushed, unsure tones though from a slightly different angle than previously. Again it is necessary to rebut this still feeble regurgitation. One can still do worse than read Sam Dolgoff's very readable and passionate account published in 1976 by Black Rose Books in Canada called: The Cuban Revolution. A Critical Perspective (It's probably now out of print). In page after page, Sam, a New York painter and decorator and though a trad-style, splendid revolutionary anarchist remorselessly exposes the betrayal of a genuine revolutionary explosion in 1959 hi-jacked by the Castro clique which, finally managed to turn the country into an appendage of Russian state capitalism succumbing, perhaps inevitably to the real politic of cold war times. It's certainly difficult considering circumstances and Cuba's basic lack of raw materials like oil, coal and steel how it could have been otherwise short of an immediate radical explosion of the dispossessed throughout the rest of Latin America. Sam's contribution was very well researched and probing. It is a fascinating account though inevitably marred somewhat by his unshakeable belief in industrial and anarcho-syndicalist unionism as well as laying too much faith on what were then modern subversive tendencies like delinquency, dodging work or even growing your hair long. From today's harsh reality it can even seem oddly but nostalgically quaint, as none of the latter manifestations were able to sustain the hope people originally had in them. All genuine initiatives like workers' coops or collectives created by an insurgent people were crushed or dissolved as giant state organisations took over all production. This was followed by a massive militarization of labour in most spheres even including the creation of a vast university called The Camile Cienfuegos University or Cuidad Scolar built symbolically at the foot of the Sierra Maestra. By 1966, militarily organised labour corps were established to rehabilitate delinquents. 'Voluntary' work was enforced and a Youth Army of Work controlled by the armed forces was created. These 'voluntary' work battalions rapidly became commonplace and were coupled to incentives for workers who demonstrated 'exemplary' behaviour (like working 30 hours a day). Arms for self-defense quickly encompassed the militarization of teenagers barely having left childhood. (Sam, horrified and aged 50, recalls how a uniformed lad barely 16 showed him around a university faculty machinegun in hand). Not that Cuba wasn't a lot subtler when required being so. Over the years the state has been quite responsive responding to the images of the times especially so during the late 1960s. 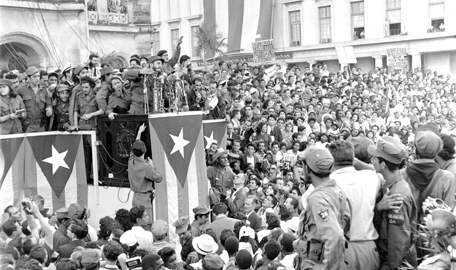 Between 1966-70, Cuban state capitalism 'tried' to devolve. And going back to seeming basics ' mostly influenced by some of Guevara's later ideas emphasising the need to do away with money ' evolving hand in hand socially with a growing free distribution of goods and services thus creating the foundation finally for 'the new man'. (No wonder Castroite/ Maoists in Europe seemed like your bosom buddies at the time!) For sure it was all fine and dandy and Guevara out in the Bolivian jungles, ever ready to take on board newer ideas, may also have meant it in a messed-up kind of way. In reality, good intentions aside, it turned out in practise to be all front. Sam Dolgoff describes it as mere 'camouflage' for the complete militarization of Cuban society, a stage that subsequently has been described as the 'mini-Stalin era' turning Cuba into the most formidable military power in Latin America. Furthermore, Castro initially said he wanted to abolish the army replacing it with peoples' militias amusingly adding he was prepared to distribute arms 'even to cats'! Ironically, though hardly surprising, the opposite happened and over the years militias were put under army control with guns confiscated and locked up every night. Militarisation paralleled and invaded a kind of Cuban-style Committee of Public Safety named The Organisation of the Committees for the Defense of the Revolution (CDR) present in all housing blocks and neighbourhoods which, as well as dispensing much needed welcome additions to ordinary Cuban citizens via health initiatives like mass vaccinations and fair food distribution, even school attendances ' things denied by the previously hated Batista regime ' nonetheless evolved into a spying network weeding out not only genuine revolutionary dissidents but those into unacceptable sexual behaviour like gays or even wife/husband cheating. The CDR finally organised police raids on 'suspect' houses sometimes delivering them to the death machine. It wasn't as though this was unique in Latin America. Somewhat similar, in Argentina a network of Peronista wards and committees ' known as the manzanerosa ' exist as intermediaries from the top down over dispensing social community favours more often than not finger misfits, undesirables and leftist troublemakers. Maybe not as nasty as they previously were these kind of things can always return if the right wing get back on their feet. Interestingly today in Cuba the CDRs once so virulent have completely seized up and to all intent and purpose no longer function. In fact nearly all aspects of Cuba's state directed forms of 'popular democracy' withered away through probable lack of interest. To combat this sclerosis, a vetted and controlled Workers' Parliament came into existence around 1995 but that too quickly fizzled out. Nonetheless, in 1976 and putting Sam Dolgoff's book in retrospect, it was much easier to knock Cuban society than now. In the interim, a massive counter-revolution of unimaginable scope has hit the world guided mainly by Anglo/American capitalism and showing few signs of faltering. In Latin America repression and death in Cuba has been far superseded by the atrocities of the militaristic right in Brazil, Argentina, Chile, Uruguay and elsewhere. Guided by the experience of this most dreadful and weird form of capitalism ever experienced, perceptions of Cuban society have dramatically changed and for concrete reasons. Conscription or even the militarization of society has meant crime in workers' neighbourhoods is much lower in Cuba than most places elsewhere in the world, never mind Latin America. Seriously capitalised drug gangs aren't a menace and the threat of inter-personal fuckhead violence is much less than in most places. Women are less scared to take a stroll in the streets or among green spaces and not so afraid of the dark. These things really matter making people in much richer societies envious of these communal givens sighing 'if only we had them here' ' half in love with military solutions calling them soft names in many wistful musings ' as crack addicts give them hell. How long Cuba remains like it is ' stuck in welcome aspic ' is a different matter. Consumer tourism is becoming important to the economy. How long before decomposition really undermines the militarised temperament? And what happens after Castro, now an octogenarian, dies or is forced to quit? Calls for genuine forms of popular democracy are returning to Cuba. Increasingly old revolutionary thinkers like Rosa Luxembourg and Lukacs are giving an airing and, needless to say, Trotsky is everywhere. It won't stop there. And to hedge a bet: Considering the effect of all the emancipatory tremors running throughout Latin America, how long before genuine peoples' revolts of the dispossessed ironically say, influenced by examples from Argentina, Chile or Bolivia etc, take off? At long last perhaps, a future grass roots explosion in Cuba is now unlikely to be hi-jacked by calls for the return of the Miami gangsters because despite the unwelcome presence of MTV, the present American way of life is finally losing its aura. But don't bet on it! No doubt Washington wants to finally kill off the virus of social revolution and these monsters are well aware of these truly liberating tendencies at play in Cuba today. Increasingly the US is seeing Cuba as the weak link in the Latin American chain and eschewing military intervention for the moment, they will throw money at Cuba like it was going out of fashion. Filthy lucre is always an old but workable solution! What perhaps is most likely is a bizarre mix of the two tendencies: a grass roots movement heavily manipulated, if not quite hi-jacked by a US inspired on-going cultural disco-like jamboree on the lines of the recent orange 'democratic revolutions' which, thankfully have failed so miserably in the former Russian satellite bloc and the middle east. A stupid film ' East of Havana ' is now doing the rounds. Starring glitz mad Hollywood celebrity Charlize Theron it contains a sub-text calling for artistic rights (you guessed it, rap-style) above everything else. Later, commenting on the film Theron says: 'The foundation of Cuba is censorship. You have to ask: would I like free healthcare and education and accept being a prisoner in my soul.' Fine words which when interpreted mean the weapon of choice will be cultural rather than militaristic in privatising everything of value in Cuba especially the national health system which, by the way, is in far better shape than the UK's. Even before Cuba's mainly agricultural trading partner the Soviet Union collapsed in 1990 the scientific and technical community with the support of an all-powerful state, had began to opt for alternative farming methods considerably reducing chemical fertilisers. The demise of the Soviet Union massively accelerated this process. Now most farming deploys biological controls rather than chemical ones. Manure, sugar cane derivatives, organic fertilisers, compost, bio soil, worm humus, shade, honey syrup and micro-organisms have been developed to produce soil nutrition and combat erosion. No longer having the support of a Soviet Union, Castro had to switch from industrial farming to more organic forms and from horticulture back to agriculture with horticulture pushed to the margins of fields and the wayside just as in the title of a pre Second World War book in the UK, 'Flowers of the Wayside and Woodland', for horticulture was pretty much a bourgeois invention and concomitant with the rise of industrial capitalism. Tractors were replaced by oxen and horses and roof gardens turned into kitchen gardens etc in urban centres. The latter was a genuine innovation with no precedent in Cuba's past though none of these developments should be taken as implying that Cuba is a post-capitalist society. (With the developing energy crisis it's almost certain that something like this will happen in Europe and America). What we have now in Cuba are huertos, which resemble British allotments, organoponics that resemble large urban farms and autoconsumos are attached to hospitals, schools and workplaces whereby they are able to grow much of their own food. Unfortunately all such splendid directives ' and Cuba has become an ecological beacon to the world ' have been carried out from the top down. It would have been so much better if all this essential experimentation had fully come from the people themselves and not via a state programme no matter how inspired. Inevitably though it's packed full of typical work scene initiative by all kinds of individuals which vitiates the paternalism of the former. At the moment it's also something of a market/state solution. The dominant form means the state takes 50% of the produce with the rest up to the gardeners' choices whether for sale in cheap farmers' market or for barter. The state looks after the gardeners providing them with a roof over their heads and free food. In a way this can still be viewed as an extension of the land reform program, which runs like an unbreakable thread through the wars of liberation and what happened subsequently in Latin America. It is popularly said in Latin America that Simon Bolivar died 'ploughing the sea'. It's a beautiful description. As a student Che Guevara was much impressed by the land reform program of the short-lived 1953 Bolivian government, in particular the resettlement of the indigenous people on the barren wastes of the alti-plano formerly theirs prior to the arrival of the conquistadors. He was less impressed by the nationalization of the tin mines if all it amounted to were a few pesos more for the miners many of whom were indigenous. He also quickly realised that all hopes of a revolution in Latin America would fail if the indigenous peoples were not brought into the revolutionary process. His failure to make meaningful contact with them in Bolivia such as had happened somewhat in the Sierra Maestra in Cuba (made easier probably by the fact the peasantry there were mainly Spanish speaking liberated slaves) doomed his Bolivian adventure and sealed his fate. Though championing land reform, (as the last consequential Bolshevik by default, slipping with Fidel almost unintentionally into the mould, that meant under the aegis of a new class state already present in guerrilla foci) at no point did Guevara ever question the mode of production i.e. the application of industrial methods to modern agriculture ' though to be fair no one outside of a handful of people in the USA did at this point in time and most were related to the ultra leftist Contemporary Issues group. We cannot be so blas' and by insisting on a change in the social relations of production (expropriation of ranchers, big farmers, the residues of the latifundistas derived from the colonial past) we are obliged to vigorously argue for a change in farming techniques, the actual mode of production. In this respect Latin America again is leading the world but, apart from Cuba, only on the peripheries, and then under the guise of neo-primitivism, a label that renders this only hope as somehow innocuous and even a bit cranky. Hopefully over the coming years this perspective will change. In considering these formidable changes or reversals to the agricultural mode of production ' a welcome stepping back into the past as it were ' we must also consider what happened in Cuba in the aftermath of Castro and the communist party coming to power. There is literally no doubt that Castro and co abolished the old ways of farming almost immediately after the 1959 'revolution'. INRA (National Institute of Agrarian Reform) was established imposing industrialised farming almost everywhere. Mechanisation was given maximum priority. Thousands of peasant farmers were evicted once the Agrarian Reform law was enacted making way for gigantic state farms essentially based on the Russian kolkhoz model. This resulted in a long and drawn out guajiro (peasant) uprising whereby some took to the Escambray Mountains becoming guerrillas yet again. The Cuban state organised a Che Guevara Trail Blazers Brigade run on strictly militaristic lines which cleared huge amounts of lands for large scale industrialised state ranches (ironically usually called cooperatives) often given over to sugar production for export especially to the Soviet Union. The farm was declared dead. The transformation and updating of agriculture was carried out in such haste that disaster was the outcome. Giant crop harvests failed and food shortages kicked in as the country resorted to importing a high percentage of staple foods. Things like this had never happened before even under the most repressive right wing regimes. In a country where bananas are literally everywhere - and even more than bread the staple diet - at one point nearly ceased to exist! Around this time the leftist French agronomist Rene Dumont initially sympathetic to the new Cuban regime, finally ascribed shortages to the abolition of the small peasant holding. Given the restricted circumstances he was probably right, as after all he had worked out a way to make the capital city, Havana, self-sufficient in foodstuffs more or less surrounding the urban centre. Dumont suggested in his book, Is Cuba Socialist? that the hypertrophied city of Havana be surrounded with a 'green belt' of market gardens and fruit farms together with a concentric belt producing sweet potatoes, potatoes, plantains etc and that a dairy farm should be established, all to be administered by a federation of small cooperatives. Moreover he concluded, 'If every family that wanted to had been able to have a small garden plot, it could have raised a good portion of its own food'. His plan was rejected though you can't help but feel Dumont's plans have recently been dusted-down from library shelves as Cuban bureaucrats, nearly 50 years later, have finally responded to his proposals though, no doubt, as a post-festum add-on. This is worth looking at again in the light of Fidel's death.